By the end of the film you’ll be scratching your head trying to separate “Art” from well… everything else. 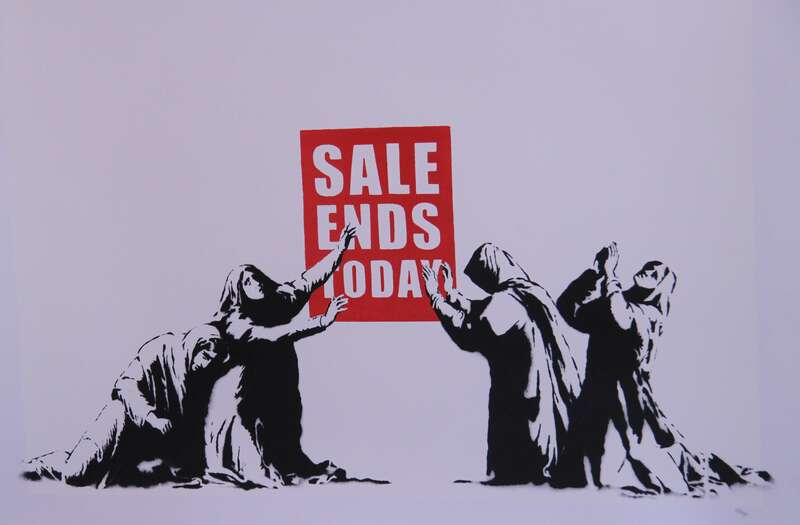 Exit Through The Gift Shop is an insightful commentary on street art, and how easily it can go from countercultural movement to a social status symbol sold to the highest bidder. The film centers on LA vintage boutique owner and confused francophone Thierry Guetta, an overweight man in his mid 40’s, with a face full of hair and a shaky command of the English language (often to comic effect). Guetta is obsessed with recording his every waking moment, which he accomplishes with the aid of a handheld camera. Guetta’s obsession with filming combined with an enthusiastic but ultimately delusional sense of the world takes him on a journey from amateur cameraman, to bogus graffiti documentarian, to self-proclaimed street artist and overnight sensation. As the first to turn a camera on the world of illicit street art, Guetta was in a unique position to document a majority of the world’s greatest street artists. Influenced by his relationships with Banksy, Shepard Fairey and others, Guetta eventually finds himself motivated to create his own art. Putting the camera down at the suggestion of his role model/friend, Banksy, Guetta takes to the LA streets, reflecting back the style of the artists he so assiduously documented. Like a happy little puppy having just been tossed a new bone, Guetta begins plastering Los Angeles with building-sized stencil portraits of his newfound persona “Mr. Brainwash”. Inspired to create an event around his art, Guetta’s prolific plastering was ultimately outshone by his self-sponsored solo exhibit of over 200 pieces. The pieces are, in some cases, massively derivative and, some might say, knockoffs and caricatures of his friends’ and mentors’ work. Instead of developing his body of work over time, Mr. Brainwash mass produces his pieces on a factory-style assembly line, staffed by several unfortunate “assistants”. When Mr. Brainwash’s solo show grosses over a million dollars in sales, it leaves the art world in a wake of questions and confusion. Was what just happened art, commerce, self-promotion? Or something far more insidious? And what implications does Mr. Brainwash’s success have for the art world? Exit Through The Gift Shop is amazing, humorous and insightful; much credit is due to the director, artist and long time social prankster, Banksy. In the end, Guetta may have us all brainwashed.